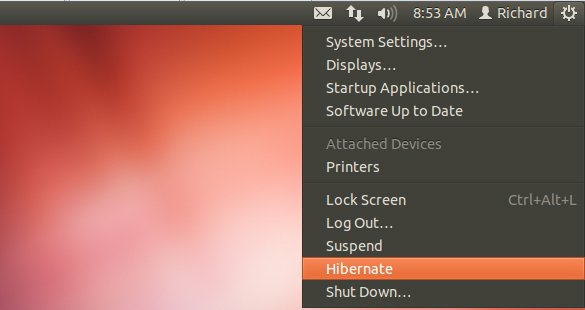 [ How to ] enable hibernation in Ubuntu 12.04 ? TECH: [ How to ] enable hibernation in Ubuntu 12.04 ? [ How to ] enable hibernation in Ubuntu 12.04 ? Before enabling hibernation, please try to test whether it works correctly by running pm-hibernate in a terminal. The system will try to hibernate. If you are able to start the system again then you are more or less safe to add an override. Restart and hibernation is back! Some users will then need to run sudo update-grub to get the hibernate option to be available in the power menu..